Farro is an ancient variety of wheat that is still cultivated in the Garfagnana area northwest of Lucca. As a soup, it is typically paired with beans– either white beans like cannellini, red kidney beans (imported from North America!) or chickpeas. (It is also combined with seafood, as a salad, in the coastal area where we spend our summers.) My own preference is for chickpeas and farro, called, zuppa di ceci e farro, it’s cooked with tomatoes and seasoned with rosemary and garlic and a pinch of hot red pepper flakes, peperoncino. 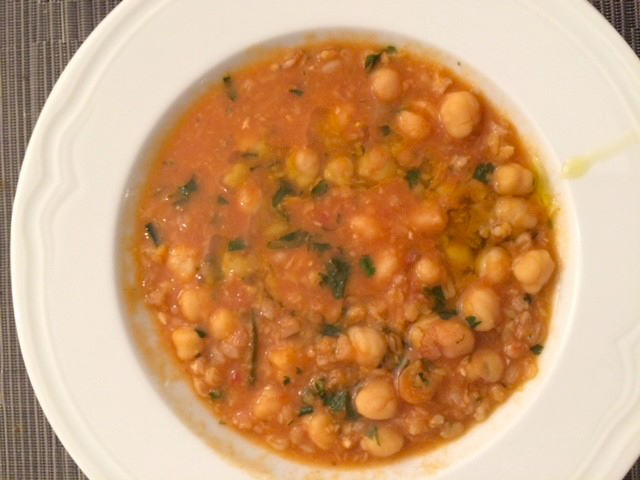 Combine the cooked chickpeas with 4 cups water, rosemary leaves, garlic, tomatoes, tomato paste, and olive oil. Bring to a boil and cook about 15 minutes, until the chickpeas are very tender. Use an immersion blender (or food processor or blender) to puree about half the cooked chickpeas and other ingredients. Bring the soup back to a simmer, add the salt and farro and continue cooking, about 30 minutes longer, until the farro is tender and the soup is thick. If it’s not thick enough, continue cooking a bit longer. Carefully pour a stream of olive oil over each serving and add a sprinkle of parsley leaves.